The series continued on June 22 with readings from Matthew 9:9-13 and Romans 12:9-18. Do you remember that one kid at school that all the teachers seemed to love, but was, in fact, a real bully? The kid who you knew to be a schemer and a manipulator, but your parents thought was just the finest example of teen manners? 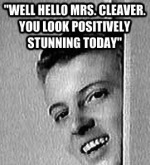 In spite of his good grooming and obsequious manners, Eddie Haskell was up to no good. Do you know the kind of person I’m talking about? You know he’s a schnook, but he seems to have snowed over everyone else. 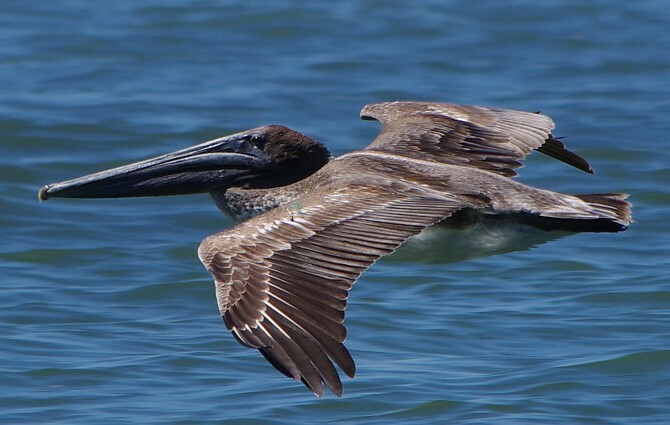 As we continue in our exploration of Jesus’ command to “consider the birds”, I’d like to introduce you to the Eddie Haskell of the bird world: the pelican. In all kinds of ways, these ungainly creatures are the class-A jerks of the avian universe. If you don’t believe me, go home and do a YouTube search wherein you will discover pelicans – who were built to eat fish – waddling around parks devouring pigeons, patrolling park ponds and swallowing baby ducklings alive, or raiding gannet nests. Not because there aren’t other sources of food nearby – but because they are just, well, jerks. In fact, my last close encounter with a pelican came while I was fishing in Florida. There was a bird who was hanging out right by the water, and as I was reeling in the fish, he would dive and attempt to swallow them while I had them hooked, but before they left the water. I know, there are lots of animals that eat other animals, but pelicans are not fierce, majestic birds of prey like eagles or falcons. They are simply overgrown bullies. The only time that the word “pelican” appears in the Revised Standard Version of the Bible is in the books of Leviticus and Deuteronomy, where Moses is giving the Israelites the complete rundown on all the animals that are considered to be unclean. 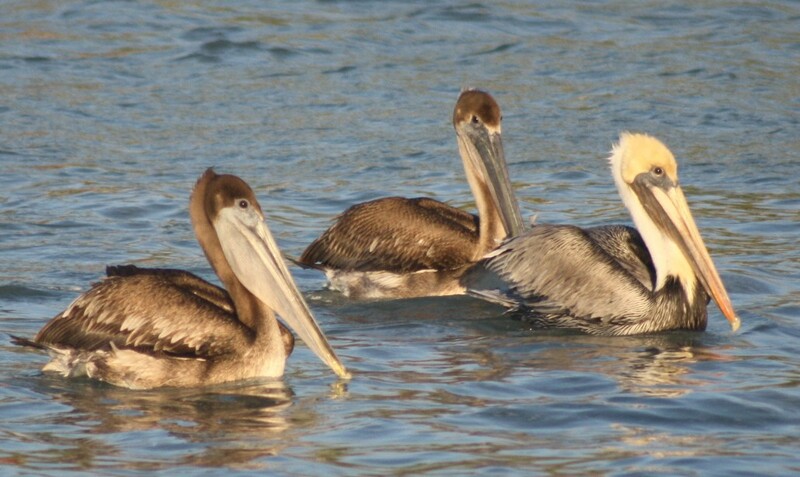 Pelicans are right there, alongside of owls, cormorants, herons, and bats. There is no scriptural confusion about pelicans – a contrast from the pigeons and doves about which we spoke last week. 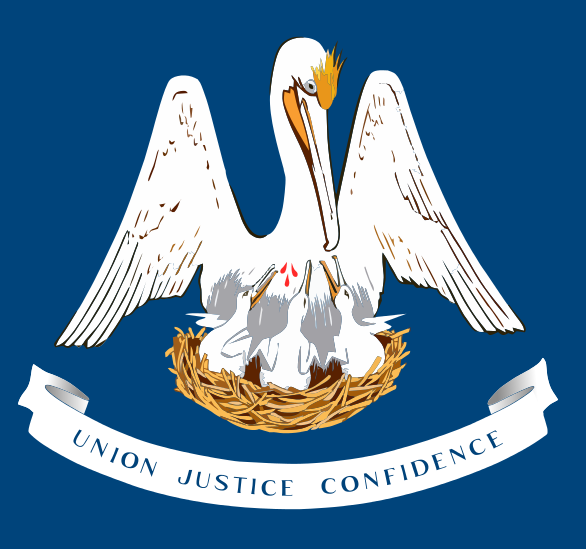 And yet look at the State Flag of Louisiana. There is a well-known heraldic seal entitled “The Pelican in Her Piety.” Here you can see a mother bird apparently piercing her own breast with her beak and feeding her young with her own blood. And so one of the leading churchmen of the 13th century, Thomas Aquinas, wrote a hymn to be sung in praise to Christ after drinking from the communion cup, the lyrics of which include “O loving pelican! O Jesu Lord!” Shakespeare and Dante refer to Jesus as a pelican. 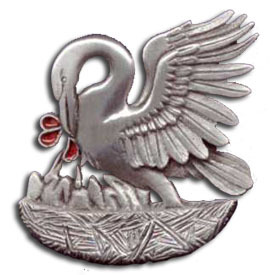 Medieval pilgrims would wear a pelican badge on their way to worship, with red gemstones signifying the bird’s allegedly life-giving blood. As I said, none of that happens. 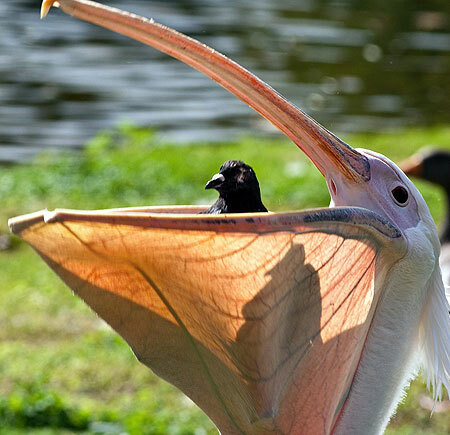 Pelicans will feed their young from their enormous pouches, and often will pull their heads back and press that pouch against their necks. Since the feathers on a pelican’s breast and the tip of the beak sometimes have a reddish tint, the ancients – watching from a distance, we presume – wrongly assumed that the bird was attacking itself and engaging in a noble self-sacrifice. For thousands of years the outward behavior of the bird fooled people into thinking that these ungainly and awkward creatures were, in fact, amazing examples of sacrificial love and care. And this is how it is that a bird listed as an abomination in Leviticus becomes the symbol for Jesus in the middle ages. It’s all a show. Then, Jesus tosses out a quote from the Old Testament book of Hosea: “I desire mercy, not sacrifice.” He’s driving these religious teachers back to the story of the time when God’s people knew that God was really angry with them for their constant disobedience, but rather than dealing with the main problem, they tried to come up with a clever way to impress God with some extra-sacred behavior. Jesus cuts them off at the knees and says flatly that God is not fooled by what he sees – he knows our hearts. The best heroes and role models are not the people who wake up every day and decide to go out and be heroic. They don’t wait until everyone is looking and then all of a sudden act nobly. No, the best heroes are those people who do the right thing because it is the right thing. They get up every day and act like people with integrity and love, and if they do it long enough, it changes reality. That led me to conclude that the reading we’ve had from Romans 12 is actually an instruction manual for everyday heroes. It’s a list of rather mundane, fairly attainable behaviors that have great power to change the world. That’s no accident, friends. The charge and benediction that I use are molded after this passage precisely because I believe that these ordinary and simple behaviors are the best way that we have to really live like followers of Jesus. Don’t get me wrong! I am all for the huge, grandiose gesture that changes history and makes everything different in a heartbeat. However, those are difficult to come by and, really, the result of a process. Defining moments are elusive, to say the least. WOW! What would happen in the neighborhood, or in the city, or in the world if a small group of people could actually live like that every day? I’ll tell you what would happen – the neighborhood, or the city, or the world might not notice behavior like that…but they would be changed nevertheless. What I mean is that if on any given day, I choose not to strike back, or I decide to share what I have, or I seek to be at peace – well, in and of itself, the action is small and the day is short. But if somehow, by God’s grace, I was able to cultivate that one-time choice into a habit, and that habit grew into a discipline, and that discipline became a characteristic – and if it wasn’t just me, but you and you and you as well…then there might be some long-term affects that could be measurable. But back to the pelicans. Perhaps you’ve been to the southern beaches, and maybe you think that my characterizing them as the “Eddie Haskells of the bird world” is a little tough. Truth be told, I like pelicans, and while I’m not ready to buy that whole line about “the pelican in her piety”, there is something noble about the way that these birds care for their young. Those same YouTube video sites that feature pelicans in all their obnoxiousness also present images of parents who bring back food to children who are in need. 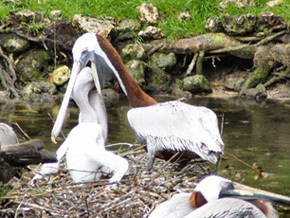 The parent returns to the nest and allows the baby to put its entire head into the beak. Mom or dad regurgitates a little fish and the baby is satisfied. In providing this food, the parent bird offers herself freely – she gives of her food, her effort, and her essence to sustain her young. It should be noted that the young are not always appreciative of this. Just imagine have one, two, or three entire heads in your mouth and gullet, reaching for that which you’ve already eaten, and then yielding it back. The young are sometimes so voracious in their feeding that they forget to breathe and they pass out for a few moments. It’s as if they don’t fully trust that the parent will feed them, and so they work themselves into a lather, they don’t come up for air, and they just faint dead away. 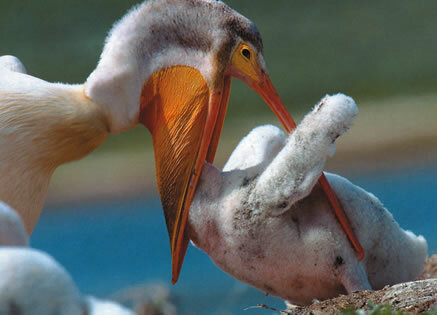 There’s something about watching a baby pelican thrusting so desperately into its parent’s gullet, not entirely believing that there is enough to sustain it that reminds me of my own faulty trust in God. So in one respect, I like the pelican because in its awkwardness and greed, it reminds me of me. But the main reason I like these birds is because of the way that they fly. Have you seen it? They soar and glide and rocket through the air, often inches above the water. I have sat for hours (usually with a fishing pole in my hand, to be perfectly honest) and watched pelicans cruising over the waves just waiting for one of them to fly a couple of inches too low and crash headlong into the surf. But it never happens. They skirt the waves endlessly – and silently. They don’t yell about it, like gulls do. They just cruise with grace and beauty. They make it look easy. That’s what I want. I want to be the kind of person who can grow up from the guzzling, suffocating greed and incapacitating distrust and somehow be able to put on those behaviors listed in Romans 12 and just glide through them…I want to love without calling attention to myself, and to extend grace as though it’s second nature…I long for us to be a community where living like that looks easy. Not because I think that God will be impressed and somehow like us better if we get good at it…but because it seems like an appropriate way to respond to the one who feeds us in every way possible, who gives himself to us daily, and who sends us out to love the world with his power. I don’t want to live a charade, or get credit for something that is not true. I want to move through the world he’s given to us in the way he made me to move, and to honor him that way. I mentioned Thomas Aquinas and his hymn about Jesus the pelican. The last verse of that song stirs something within me about living faithfully and gracefully, realizing that we do not do it because God needs to see it, but because it’s how we are wired. In the name of the Father, and the Son, and the Holy Spiirt, amen. 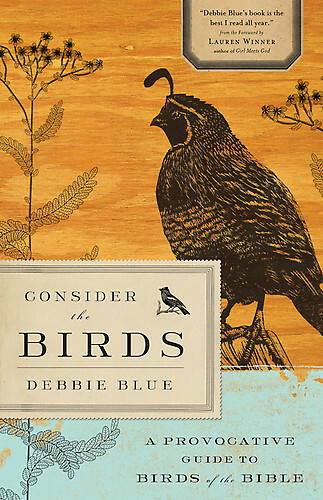 Some months ago I read Debbie Blue’s Consider the Birds, and for the first time in years, I felt compelled to share some of her insights in the form of a sermon series. To that end, the folks in Crafton Heights will spend ten weeks in the Summer of 2014 considering some of the insights brought forward in that volume and by the creatures and stories featured therein. For the sake of brevity, let me simply say that if you read something that strikes you as profound and wise, it probably comes from her work. If you read something that seems a little heretical, well, chances are that it’s from me. The series began on June 15 with readings from Mark 1:9-13 and Genesis 1:1-5. On this day, we celebrated two baptisms and also commissioned the Summer ministry staff at the church. What is the best-known collection of Jesus’ ethical teachings? The Sermon on the Mount, right? I mean, everyone has heard something about the Sermon on the Mount, and many people, even those who profess to have no faith in Christ, would say that Jesus is on to something in those verses. I love the birds. And I love Jesus. So when I saw a new book by Debbie Blue entitled Consider the Birds: a Provocative Guide to Birds of the Bible, well, that just seemed like a good excuse for a little continuing education that I could not pass up. And when I read this volume, I knew that I wanted to share some of her insights with you, sprinkled in with a little of my own thought. If you’d like to purchase a copy of the book for your own pleasure or edification, I have a few of them here and, of course, they are available in stores or online. Consider the birds for a moment. If God were a bird, what kind of bird would God be? Oh, jeez, Dave, that’s a softball. God would be a dove. Most often in scripture, when we read about some description of God as a bird, he shows up as a dove. It’s right there in Mark 1. In fact, early on – the Genesis reading – says that “The Spirit of God was hovering over the face of the water.” In the Jewish tradition, the Talmud adds the words “like a dove”. Remember when Noah wanted to see if there was any hope for the inhabitants of the Ark? He sent out a raven first, but everyone knows you can’t trust those birds. Then a dove, right? 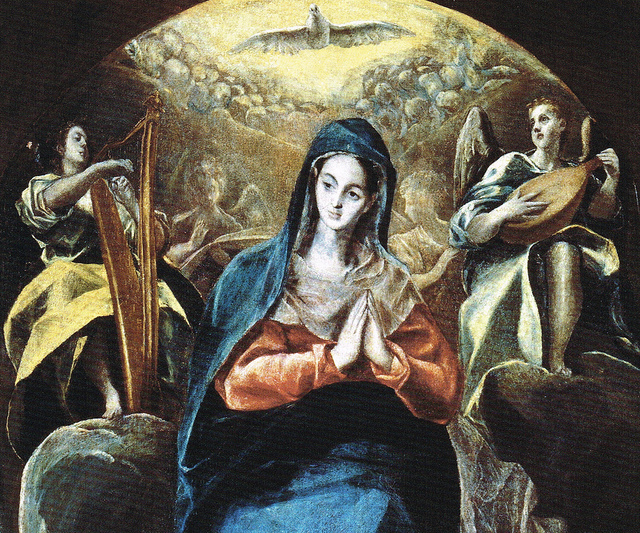 In all the paintings of the Annunciation and the Immaculate Conception, how is the Holy portrayed? With a dove! Of course, the twenty-first century has continued the historical identification of the dove with the holy. Look at all the places that little dove sticker has shown up – on cars, tattoos, clothing, backpacks – you name it, and there’s someone willing to sell you a dove symbol to slap onto it in the name of “evangelism” or “testimony”. Before going further, I have to say that as much as I like birds, I find that to be a little irritating – as if the Holy Spirit was a fragile, delicate, even dainty presence. As if Christians, like Noah’s dove, are too good for the “real world”. At any rate, would you agree that often, we see the attributes of God in the image of a dove? Yes? Let me ask you, then, whether your concept of the divine would change if Mark said, “he saw the heavens open and the Spirit descending on him like a pigeon…”? The truth, as you may know, is that the family Columbidae consists of 310 related species that are called, interchangeably, pigeons or doves. There is no standard rule as to which label to put on which bird. “Pigeon” is from a Latin root that apparently refers to the peeping of the chicks, and “Dove” is of Germanic origin, and refers to the diving flight pattern these birds share. I learned that these words are used interchangeably while on a trip to Malawi some years ago. I was visiting a very poor village, but one man seemed to be doing all right. He had invited me into his home for dinner, and I asked what he did for a living. He indicated that he was a farmer and a breeder, and he raised doves for a living – that they were a very good source of meat. “Well,” I thought to myself, “that sounds really interesting…” And, I will confess to you, I felt a little sophisticated that evening, sitting in his home, thinking that I was dining on freshly-harvested dove. And then, after dinner, he took me to the rear of his home and showed me his coops – small cages, filled, not with the holy, innocent birds of my imagination, but with pigeons. Flying rats. Pests. Dirty, dirty birds. But the scripture says that the Spirit appeared like a peristeron – a word that is sometimes translated as “dove” and other times as “pigeon.” Is God like a pigeon? Seriously? Well, what do you know about pigeons? Maybe you know that pigeons, or doves, are used as tools for communication. 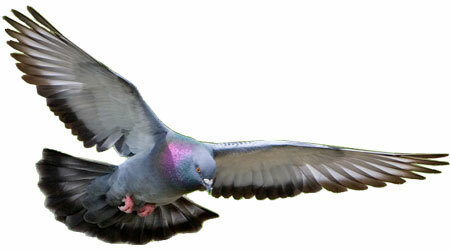 Three thousand years ago, the Greeks used homing pigeons to deliver the results of Olympic races. The outcome of the Battle of Waterloo was first delivered to England by means of a carrier pigeon. Thirty-two pigeons have been awarded medals by the US military for carrying important information across enemy lines. Before the advent of drones, both the German Nazis and the American CIA fitted pigeons with little cameras and sent them aloft to gather information about the enemy. Pigeons are everywhere. The only places on earth without some form of pigeon inhabitant are the extreme polar regions. Otherwise, however, you will find these birds just about anywhere that human beings can be found. And, interestingly enough, while some birds are quite shy and are apt to take flight if they sense the presence of humans, pigeons are the opposite: they actually prefer living in an environment that is well-populated. Think of that: pigeons carry news, they can be found just about anywhere, and delight in the company of humanity. Aren’t all of those things attributes of the Holy? Isn’t God like that? I mean, the Holy Spirit brought a message in Mark: “You are my son, my beloved, and I am deeply pleased!” Psalm 139 reminds us that there is no place on earth we can go to escape God’s spirit. And of course the Bible is full of references to the delight and love that God shares in his creation of human beings. Maybe God is like a pigeon. No, no, no! Doves, I can take. Pigeons are disgusting vermin. God is not like that. Pigeons are unclean. The Holy Spirit, and God moving through Christ – that is clean and pure. The Annunciation and Incarnation announce the truth: God is enfleshed. The Almighty has become one of us. Do you believe that? And you know the truth: that to be human is to experience, endure, and even to cause some measure of unpleasantness. There are smells and wrinkles and sounds of which we are not (or at least should not be) proud. You know what I mean: you people, in all of your human-ness and fleshiness and embodiment can be, well, disgusting at times. And yet God the Father has sent God the Son in the power of the Holy Spirit to be one of us. God chose to participate in human-ness. And human-ness can be a messy business! There’s something about the story of God becoming human, entering the body fully, touching all over everything unclean – eating, defecating, suffering, dying…that seems to be the thrust of the narratives. 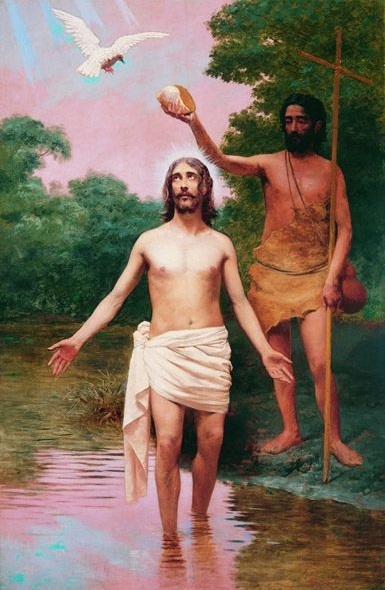 Jesus starts out his ministry by being baptized…a symbol of death and renewed life…Gods don’t generally die – nor would they stoop to being baptized in the river with the masses of the ordinary. To be alive involves a lot: suffering and taste buds and sweetness and muck. The spirit of God is not apart from this. It hovered over the deep and called out life. John the Baptist says he saw it descend as a dove – a pigeon. It lands, hovers, plunges, and coos; coming again and again, leaving its droppings on our sleeves. We can hit it with a stick all day long, but it keeps racing to us, desirous that we might open our hearts. 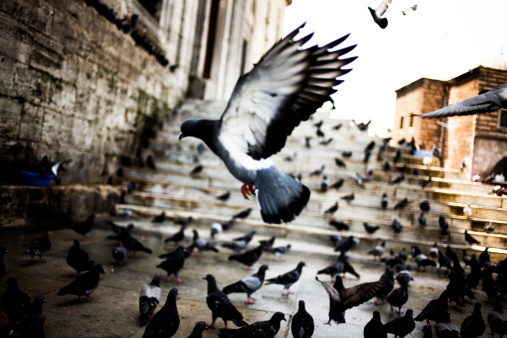 Listen: the Spirit of God is hovering, like a pigeon, in your world. The good news of the dove-ish, pigeon-like God is that no place is too messy, and no person is too impure, and no part of your life is beyond God’s reach. Ask Jason and Kelly, or Jason and Amanda, or any of our Cross Trainer staff if they awaken every day to see only sweetness and light, unadulterated joy and innocence, or beatific and delightful aromas coming from the children that they have been given to love for a lifetime or for a season. There is a lot of spit-up, poopy diapers, body odor, and general grossness involved with coming alongside of people in their human-ness. I am reminded of the time a few years back when one of the Cross Trainer staff come to me and said, “Um, Pastor Dave, will you come and take a look at this? Because this one little boy’s hair is, well, um, moving. I don’t think it’s supposed to look like that.” Yeah. Lice at the summer camp. Being human is not for the rosy-eyed optimists, the unsullied idealists, the faint of heart, or those who are afraid to enter the “real world” for fear of being polluted. And yet, God in Christ has identified with us so completely in our humanity that he undergoes a baptism. Thanks be to God for his willingness to enter fully into where we are, and who we are, and what we are so that we might better glimpse where, who, and what God is. In a few moments, you will be called to leave this sanctuary and enter into the messiness, the impurity, the ordinariness of life in your world. Don’t be afraid to mix it up with the messiness of life and love, and with people who are not as “pure” as you wish they were. Don’t be surprised when you discover that you are not as “pure” as you’d like your pastor to believe you are. God is, no matter how difficult you may find it to believe, with you. [God] lands, hovers, plunges, and coos; coming again and again, leaving its droppings on our sleeves. We can hit [God] with a stick all day long, but [He] keeps racing to us, desirous that we might open our hearts. As I studied the scripture for The Day of Pentecost and thought about the gift and power of the Holy Spirit, I was struck by a number of images and emotions that were not necessarily linear. So I wrote a story that came out of my reading of Numbers. I don’t know how much of it happened like this, but I hope that some of it did, anyway. As you listen, it’s probably important for you to know that in the languages in which the Bible was written, Hebrew and Greek, the words for “wind” and “breath” and “spirit” are all the same. So if I said, “The fierce wind took my breath away and sapped my spirit”, I’d be using the same word 3 times in the same sentence. The scriptures for the day can be found in Acts 2:1-13 and Numbers 11. You’d think it would be the heat. And I’m not going to lie, the heat was simply brutal. But the thing to remember is that the heat had always been brutal. We had lived with the same dry, dusty heat every day while we were in Egypt. When we got out of there and found ourselves in the desert, we were not at all surprised by how hot it could get. Heat we knew. What caught so many people off-guard, however, was the wind. The howling, driving, constant wind. You know the truth: there were times when that wind was a friend to us as we traveled. I know that we could not have crossed the Red Sea without the power of the wind driving back the waters. And many a night I fell asleep thanking the Lord for the breeze that wafted through my tent. But often – surprisingly often – the wind was a foe. It was unrelenting in its biting, stinging, blinding onslaught. You felt so vulnerable when you walked into its teeth – and as the sand was flung against you, any exposed skin felt as if you’d just stepped into a beehive. They have wind in Egypt, of course, but there, we had buildings and quarries to hide in. There was a place to escape its fury. But there in the desert, we were simply exposed, and after a while, you get tired of being so vulnerable. So we complained to Moses. And, bless him, he complained to God. And God said that he’d send his wind – his Spirit – to his people. He told Moses to take seventy of the elders to receive the Spirit. Seventy. You know that created a problem. There are twelve tribes in Israel. If every tribe sent six elders, we’d have seventy-two. Why didn’t the Lord just ask for seventy-two? That would have been easy. But each tribe sent six, and nobody listened when Moses suggested that two of the tribes could withhold a representative voluntarily. Moses agreed to take all seventy-two outside of camp. He asked me to make a box, and to fill the box with seventy-two lots – slips of papyrus paper. He asked me to mark seventy of them with the word “elder”, and to leave two blank. The plan was that once all the men had left the camp, they’d pull their lots. The two who drew blank lots – the ones whom God did not want – would then return to the camp to wait with the rest of the people. I made the box, and I filled it with papyrus. I carried it alongside of the leaders until we got to the appointed spot. As we began to prepare to draw lots, someone noticed that there were only seventy elders present. Two were missing. Moses decided that we didn’t need the lots, and we didn’t need the box, and, frankly, they didn’t need me – and so he sent me back to the camp. It took the men a while, but what eventually came out was that they were afraid to be seen as failures. Both Medad and Eldad confessed that they were not worthy of the Spirit of God. They were nervous about being the ones to pick a blank lot in front of the assembly and being shamed by that. They did not want everyone to know that they were not worthy – that God had no use for people like them. And so they stayed in the camp, tending to the needs of the people who were there. A couple of hours later, a fierce wind blew through the camp, and I knew that it must have been the signal of the presence of the Spirit of God. I wondered what it would have been like to be out there with Moses and the others, hearing the breath of God in the gathering of those God had called. When the wind was at its fiercest, though, a commotion erupted right outside my tent. I emerged to discover that Eldad and Medad had been filled with the Spirit of God and were prophesying to the people. They were saying that God intended to bless all of his children, and that we were being saved so that we would be a blessing to others. And then they said something that seemed impossible: they said that we would all have meat to eat that day. Moses would want to know that this was going on. This had never happened before. I ran – I ran as fast as I could outside the camp. Right before I got to the group, Joshua came running to meet me and asked what the problem was. I told him what I had seen, and he grew white as a sheet. Moses was sitting with the other men, they all looked as though they were taking a rest – as if they’d just been through some sort of strenuous workout. I stood where I was, afraid to do anything, but Joshua hustled over to the old man and told him what had gone on back in the camp. You could tell Joshua was furious, wondering who these men thought that they were to try to speak for God without Moses around! 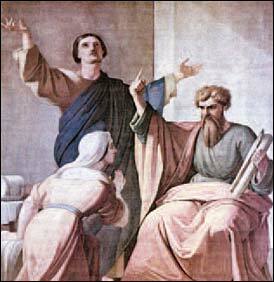 In fact, Joshua (no spring chicken himself) offered to run back to camp and personally stop the prophesying. We remained in the spot for a few more moments, but it was apparent that the wind had stopped blowing and the elders would not prophesy again. 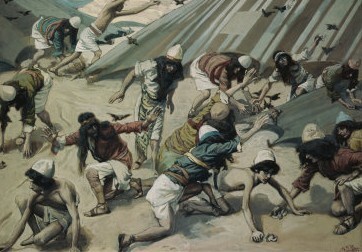 Moses was eager to return to camp, and when we got back he went straight for Medad and Eldad. I’ll tell you the truth: when they saw Moses coming towards them, it was their turn to be pale with fear, but he kissed them both on the cheek and they sat and spoke quietly for an hour or so. I don’t have any idea what they said, but I know this: as dusk approached, the wind kicked up again. It was a fierce, howling wind that drove us all into our tents for shelter. It sounded like the raging of a storm outside for forty-five minutes. And suddenly, it grew quiet. There was nothing to hear. I was afraid I had gone deaf. And then, the laughter. I heard laughter. I walked outside the tent and looked around and as far as I could see, the ground was covered in quail. Heaps and heaps of birds, just laying there! Moses was there, with Medad and Eldad, encouraging people to go ahead and eat. Some of the people were greedy and making a scene, but many were unsure. Moses again encouraged us to gather and prepare the food. He told me I should save some to dry out for later, and he asked me if I had something to put the birds in. He saw the box I’d made and filled with papyrus, and walked toward it. I tried to get there before him, but he was surprisingly quick. When he went to open the box that he’d asked me to make for him, he discovered my secret. I had made the box exactly as he’d asked me to. I had gotten seventy-two papyri, exactly as he’d asked me to. And each of those ballots was still inside the box. None of that was a secret. Yet I feared his reaction when he discovered that not a single one of those papyri was marked with the symbol for “elder”. There were, in fact, seventy-two blank ballots there. As I remember that day, I know that if I try to tell you how hot it is in this wilderness, you might not believe me. I know that not everywhere is hot, and not every wilderness is the same. Maybe you have never felt heat such as that through which we walked those years in the desert. I can accept that. But I cannot believe that you do not know the wind, because I know that the wind is everywhere. And listen to me, people: today, as you move through your world, be it desert or forest, take note of the wind. I know that at times the wind is biting and furious. The wind can send a painful trial to even the most patient of men. And yet I also know that sometimes, the things that appear to be most difficult to endure can lead you to a place where you can discover the very breath of God. You might not have been among those who were called to go outside the camp on that day, selected as a prophet by God. But that doesn’t mean that God does not want you. It is true – in and of ourselves, none of us are worthy to carry the Breath of God. But the Spirit/Wind/Breath of God blows anyway. The Spirit/Wind/Breath of God is God’s gift to and through people like Eldad and Medad; people like you and me. Listen for that wind. Don’t be afraid to walk in it. And don’t forget to look for the quail. The church in Crafton Heights is using the time between Easter and Pentecost to consider how the earliest Christians grew from being timid, hesitant “followers” to being bold, courageous “apostles”. In so doing, we’ll visit some churches around the ancient world and seek to learn from our older brothers and sisters in faith. On June 1, we visited Corinth, and talked about the ways that God called an unlikely group of folks together to accomplish a great mission. You can read about it in Acts 18:1-11. So they’ll still talk about us when we’ve died. There is a temptation, I think, to imagine the earliest followers of Jesus sitting around Jerusalem or Galilee, missing him and then deciding, “You know what? Let’s start up a church or something!” As if the Body of Christ arose because a few fishermen decided to make it happen and planned it out as a way to capitalize on their friendship and experiences. The reality, of course, is that they were huddled together and trying to be faithful to the commission he’d given them. Before too long, their incessant preaching about the good news of Jesus’ resurrection resulted in some unwanted attention from the authorities and the death of one of their number, a man named Stephen. In the confusion that followed, the church scattered throughout the Roman Empire as followers became leaders, students became teachers, and disciples became apostles. In recent weeks we have had the privilege of watching the spread of the gospel across the Middle East and up through Asia Minor into Europe. We’ve seen that the early church has a number of hallmarks, including a sincere faith and simple obedience, a commitment to holiness as away of life, an embrace of diversity amongst its members, and a willingness to risk itself on those the world sees as “nobodies”. Today, we find ourselves in Corinth, a “Navy town” just south of Athens and commanding the Peloponnesian Peninsula. The strip of land on which that town sat was low and flat and it actually made more sense for seafarers to unload their ships in the Aegean sea and have them picked up in the Gulf of Corinth than to sail them all the way around the peninsula. Because of this commerce, Corinth was a wealthy town. The city was destroyed about 150 BC and stood empty for a century or so, when Julius Caesar re-founded it as a Roman Colony. When he did this, many of the city’s new inhabitants were Roman Freedmen – former slaves who had been granted citizenship. That means then when Paul arrived to preach the Gospel, the town was “young” in comparison to much of the rest of the world, and its occupants were only a few generations removed from stagnancy and slavery. In the midst of this “melting pot” of the Empire, an unlikely set of characters emerges to found the Christian Church of Corinth. The leading man in the drama, of course, is Paul of Tarsus. We’ve met him before – a powerful and dynamic old Pharisee who bounced from place to place preaching Jesus wherever he could. Here, he meets up with Aquila and Priscilla, a husband and wife team who are refugees from Rome. They are joined by Silas, a strong young man who is a Roman citizen and had been raised as a Jew. Timothy is there – Paul’s young friend who had been raised in a gentile household and had come to know Christ through Paul’s preaching. 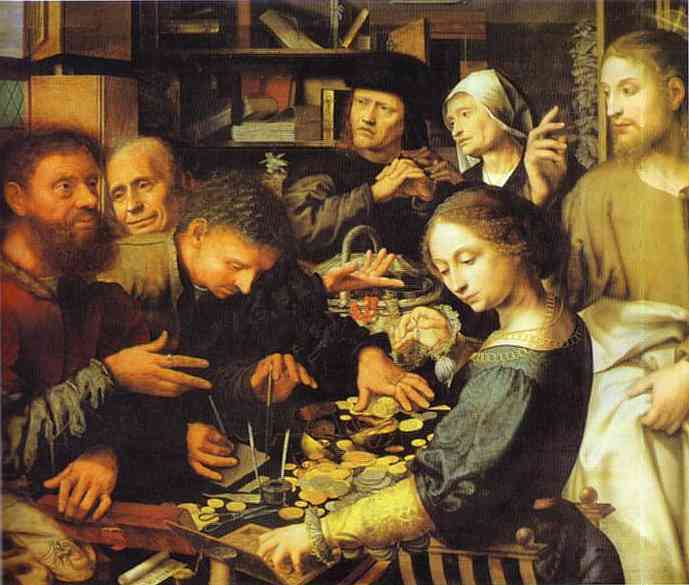 While there, these five people find hospitality first in the person of Titius Justus, a wealthy gentile convert to Judaism and Crispus, one of the leading and wealthiest Jews in that city. Both Titius and Crispus respond to the movement of the Holy Spirit and give their lives to Jesus. Can you imagine this unlikely collection of people? What a crazy way to launch a movement. 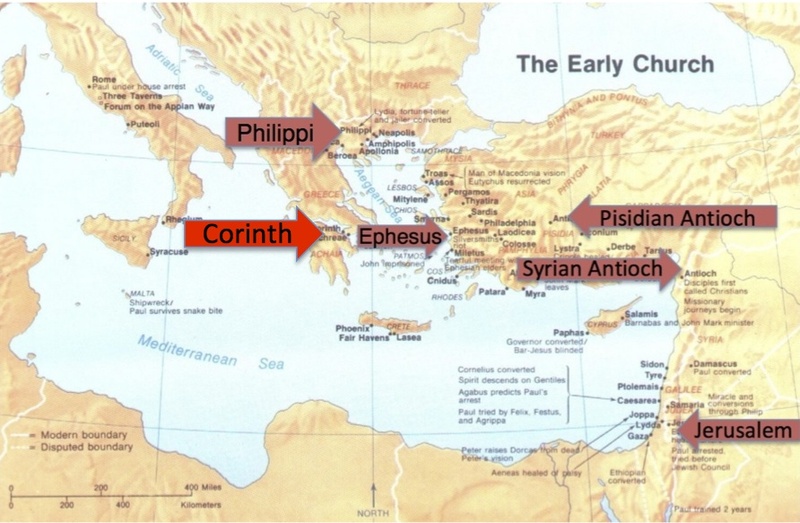 In fact, it sounds like the beginning of a bad theological joke: A Pharisee, some refugees, a couple of Romans and a few rich Jews walk into a Peninsula… But those seven people are the ones that God starts with when he launches First Church, Corinth. Here’s today’s trivia question: what film has been shown the most often in the history of American television? The answer: The Wizard of Oz. What would you suppose is number 2? Think about this group of people in Corinth, and about those two movies, along with just about every “buddy” movie ever made – for example, The Dirty Dozen, Toy Story, or Lord of the Rings. There is at least one particular aspect of those plot lines that carries over from film to film: the fact that the characters are thrust together by an outside force and are made acutely aware of the differences between them. “But he’s an action figure!” “Who let the dwarves in?” In many circumstances, these differences would prevent the characters from ever relating to each other. But in each of these films – and in the early church – the characters find themselves in a situation where the mission of protecting the town, defeating the Nazis, or destroying the Ring of Power matters more to them than the differences of which they were first aware. And so Dorothy leaves Oz, the village in Mexico is saved, and Woody and Buzz live to make another movie. 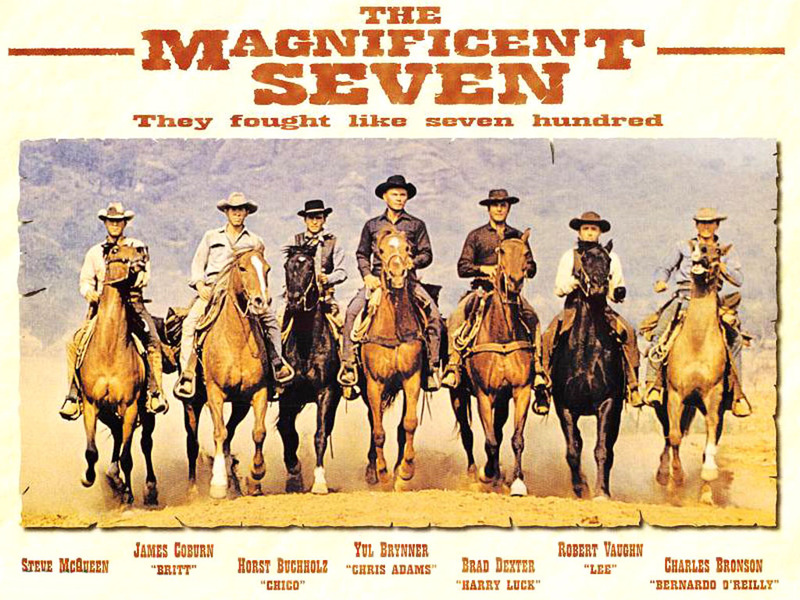 It is entirely possible to envision a situation where the magnificent seven people mentioned in Acts 18 would find themselves in a room together, take a collective sniff, and walk out without ever coming to know each other or the task to which they were called. Instead, though, these men and woman came together for the sake of the One who had called them all to himself. They committed their lives to each other, and they brought out the best in each other for the sake of the Gospel of Jesus Christ. This kind of commitment and call is not unique to Corinth, of course, but it’s demonstrated very well here. We see that the early church would not have survived without the twin realities of fellowship and accountability. Because these people came together and chose to relate to each other in this way, the world was changed by the power of Jesus Christ. The sad reality is that in 21st-century America, we can convince ourselves that we really don’t need these things at all in order to be faithful to Jesus. In the absence of real pressure or persecution, we find it easier to pick at the things that we don’t like about each other rather than losing ourselves in the immensity of the call that we’ve been given. In much of the church today, the word “accountability” is never mentioned and “fellowship” has come to mean hanging around a sterile room with coffee and donuts for fifteen minutes after a worship service in which nobody has really spoken to anyone else. We’re all deeply concerned about “our personal relationship with Jesus”, but not, apparently, overly committed to walking around inside that reality with anyone else. Fellowship is a relationship of inner unity among believers that expresses itself in outer co-participation with Christ and one another in accomplishing God’s will on earth. I know, that sounds way more complicated than lining up for cookies in the back room before we head home, but it’s a goal worth striving for. But more than a goal worth striving for, it’s something that has saved my life and has shaped the reality of a core group of my friends and colleagues in ways that I believe have changed the world right here in Pittsburgh. For at least the last fifteen years, every other Wednesday morning I spend two hours with a group of seven other Christian leaders. Most of these guys, most of the time that we have been together, have been pastors – but not always. To be honest, if you were to come into the church at 7:30 on Wednesday morning, you might be amused to hear the volume of the laughter that comes out of that room. Sometimes we use our time together to complain about the churches we serve, and occasionally we offer our services as armchair quarterbacks for the Steelers. But I am here to tell you that there is not a day that goes by that we don’t remember the mission that has called us into that room together. And that collective memory, and the practice of it, has led that group of men to a practice of fellowship that allows us to walk into the messiest breakdowns, the most painful losses, the wildest opportunities, and the deepest questionings that our lives and ministries have brought to us. We come together, you see, because we realize that we need each other in order to accomplish that mission on which we have been sent by Jesus. And that level of fellowship leads, it seems to me, directly to a practice of accountability that is reflective of that practiced by the early church. When I use the word “accountability”, I mean that we are willing to love each other enough to tell the truth to each other. This practice implies a mutual submission to the mission of which I’ve spoken – we’ve got to be convinced that the call we’ve received (to be the Body of Christ) is worth the risk of naming truth to someone who might not want to hear it at the time. As we do this, we have to remember that it’s not about who is right and who is wrong, but rather it’s about positioning ourselves, each other, and the group so that we can be best able to hear what God would have us hear in the days that we’ve been given. It’s not all that complicated, you know. I mean, I was sitting with Margaret Tranter watching “Dr. Phil” the other day, and it occurred to me that’s all he does – speak truth to people who need to hear it. “So, how’s that working out for you?” and “What are you going to do about that?” are the two most important questions that Dr. Phil asks. Of course, it means a little more when one of your best friends asks you those questions after you’ve unfolded a story of frailty and folly…and it’s a lot easier to answer them when you’re not in front of a television audience, and the person who is asking you the question is willing to walk with you towards the answer… but, I repeat, it’s not complicated. Sometimes, it’s just hard. Accountability is like that. All of which leads me to the question of the day. We see the church in Corinth growing in faithfulness because the people there are willing to engage with each other and to offer themselves up to God in intentional relationships characterized by fellowship and accountability. I’ve told you about one way that I’m trying to do that in my own life. What are you doing to participate in that kind of lifestyle? Who knows you? Who hears your dreams? Who helps you be better than you are? Who tells you the sometimes-ugly truth about yourself? Who helps you to hear the grace of God when you are sure you don’t deserve it? Who walks with you when you’re not sure you can stand on your own? Who celebrates with you when you are happier than you have any right to be? Is there anyone like that in your life? As you think about answering that, let me offer you a couple of thoughts, and a baby step. Here’s the easiest thing you can do to move toward that. Get your picture taken for the church directory. I know, I know, you hate the hardsell. You don’t like to primp for photos. You think it’s a racket. Get over it. Last time I checked, there were 13 people who had signed up to have their photos taken for our church directory. For crying out loud, people, how are we going to get into life-changing relationships with people if we’re not sure what their names are? Sign up for that stupid directory and get a copy and figure out who you are. Because look around the room, beloved. We have been called to a great mission – the greatest! We have been asked to represent the Body of Christ in this place at this time. And these folks? We’re the ones that you’re stuck with. Look, Steve McQueen might not have wished to be working with Yul Brenner or Charles Bronson to save that village in Mexico, but somehow they wound up in the same movie. Just like you. Can we continue to grow in our ability to embrace community as we move towards the mission on which we’ve been sent? But past having your photo taken, and beyond your grudging acceptance that you’re stuck in a movie with people like me, let me ask you to find someone, or someones, in whom to invest yourself. Maybe it’s a group of people, such as the ladies who gather here on Tuesday mornings. Maybe it’s one other person that you can just check in with each week – and if she or he isn’t here, that you’ll call or text and find out what happened. Look for a chance to share one of your passions – fishing, gardening, birdwatching – whatever! – with someone as a means by which you can connect about things that really matter. Are you in a relationship where you can offer feedback to someone else as they attempt to live a life that is faithful to Jesus? Are you able to tell someone else about the places that are difficult for you? Next week, we’ll gather here for the Lord’s Supper as we celebrate the “birthday of the church” on Pentecost. I dare you to show up here ready to participate, not in a private devotion or personal sacrament, but in the common call that is ours as followers of Jesus. There is one bread. One body. We are in this together, my friends. Let’s look for ways to act like that every day. Thanks be to God for the Body of Christ. Amen.